The government of India has imposed an anti-dumping duty on certain types of truck-bus radial tyres to protect the domestic tyre manufacturers from below-cost shipments from China. The anti-dumping duty has been imposed in the range of USD 245.35 - 452.33 per tonne for the duration of five years. The truck and bus radial tyres constitute 55% of total industry`s revenue. The TBR tyres imports to India have also been mounting over the past few years. According to Automotive Tyre Manufacturers Association (ATMA), they have been staggering 200 percent during the past three years, from 40,000 units a month in FY14 to about 120,000 units in FY17. Imported tyres account for 40% of the replacement demand for TBR tyres in India. China`s share in the import pie has risen from 40 per cent in FY14 to 92 per cent in FY17. 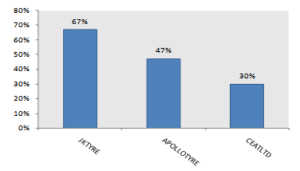 We believe that the imposition of anti-dumping duty on TBR tyres will directly benefit the players that have a market share of 31%, 24% and 13%, like JKTYRE, APOLLOTYRE and MRF respectively. Indian tyre manufacturers had been facing stiff competition from Chinese players. Overcapacity and slowdown in demand in local consumption led to the dumping of tyres in India, US and Europe. The US and Europe took the restrictive measures by coming up with anti-dumping duty on Chinese tyres. This resulted in an increase in the dumping of tyres in India. The import of Chinese TBR tyres rose by 9% YoY to 120,000 units a month in FY17. The Chinese tyres were approximately 30% lower priced than its Indian peers. The indiscriminating import severely damaged the domestic tyre industry. With expansion in capacity for TBR, the capacity utilization levels came down to 60-65% from 80-85% three years ago. Currently, China accounts for over 90% of the total TBR import in India. 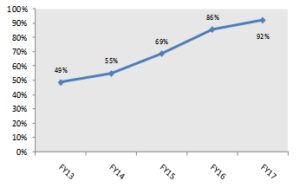 Domestic players have witnessed a sharp decline in margins due to low pricing of Chinese tyres. According to ATMA, as much as 60% of the TBR tyres imports are done through small operators and traders, who were selling tyres through cash. During demonetization, tyres sold and imported through this route were severely impacted (Chinese imports were down 30%). 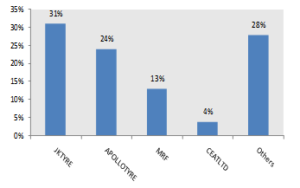 Increasing imports of Chinese TBR tyres had also been significantly risking industries investment of Rs. 35000 crores. However, these imports mushroomed back again on re-monetization. The price differential between the Chinese and domestic tyres will come down drastically due to imposed anti-dumping duty and the Chinese tyres imports will come down going ahead as they will face stiff competition from Indian tyre manufacturers. We believe that the domestic tyre industry may witness strong volume growth and margins going forward. Naveen Kumar Dubey is fundamental research analyst at Narnolia Research covering Auto sector. He is post graduate in Finance.Naveen Kumar Dubey is fundamental research analyst at Narnolia Research covering Auto sector. He is post graduate in Finance.